We checked this iPad accessory out at our local library. 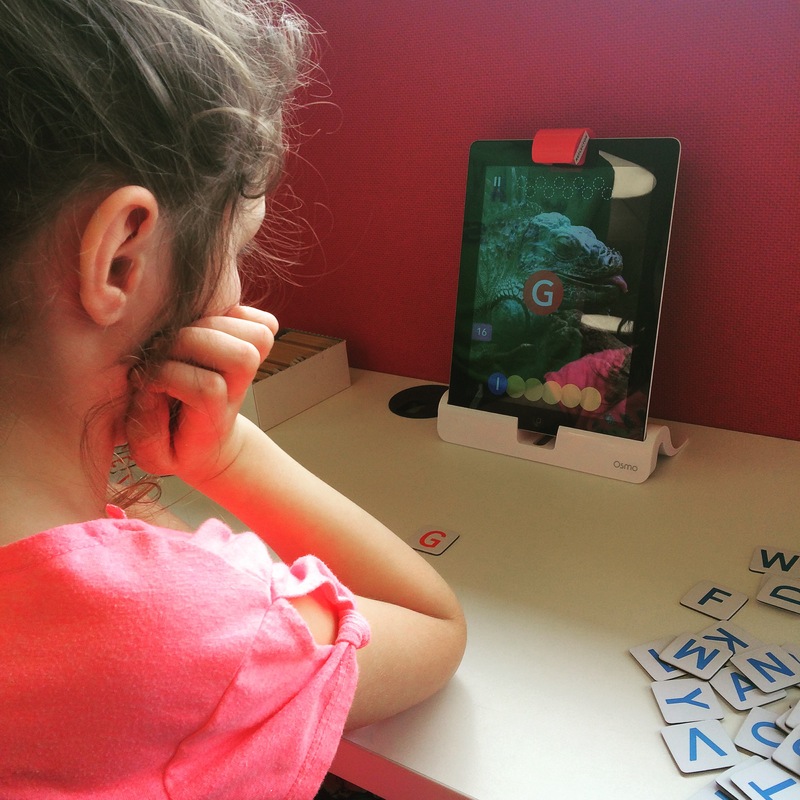 The company describes their product as “a kid’s technology system that brings the physical and digital worlds together.” The kit comes with an iPad stand, reflector, tans, and letter tiles. My kids tried out the Words app first. It would display an image and a blank set of letter spaces. You place a tile and it will “speak” with the iPad app. They had to first determine what the item was (lizard, iguana? ), and then try to spell it. Blank spaces on the top were for incorrect letter guesses. They would take turns offering letters to the front of the iPad, with a little guidance from their dad :-). The game was a digital cross between hangman and Wheel of Fortune. Possible literacy center? 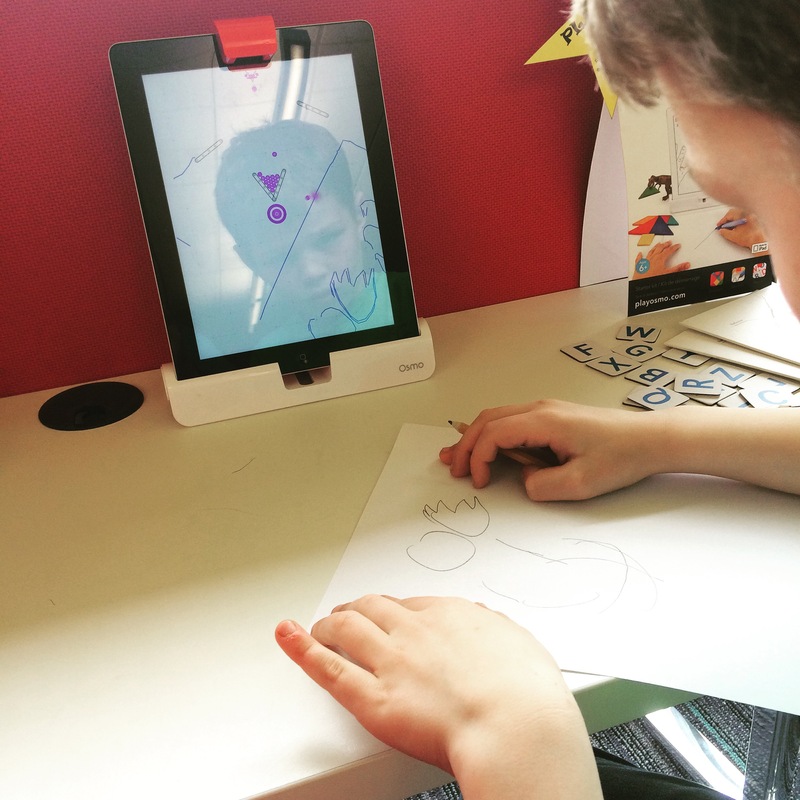 Next, my son started Masterpiece, an app that reflects your drawing on paper to the outline on the screen. 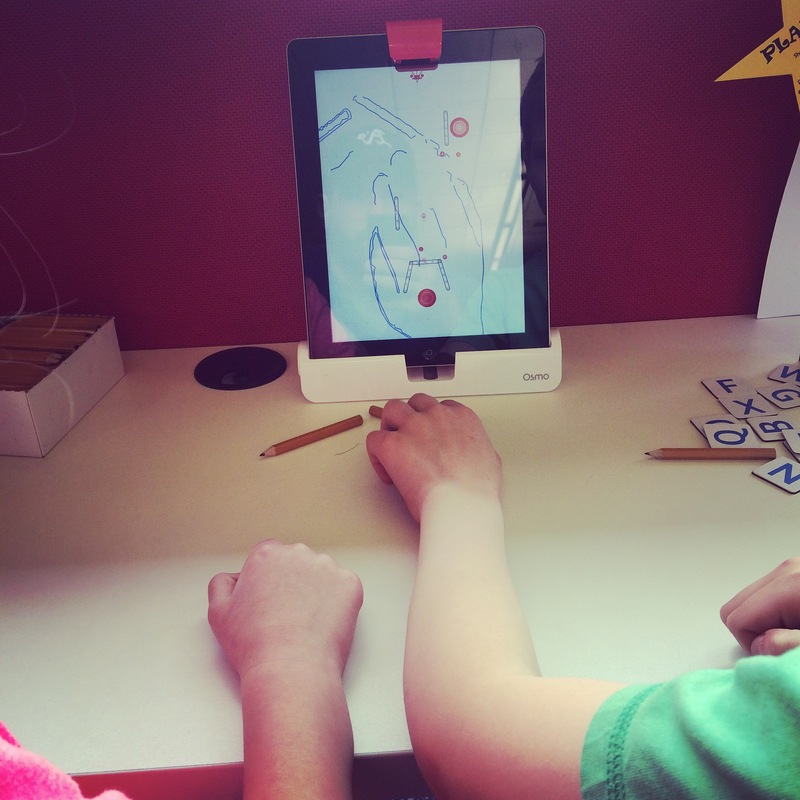 Whatever he drew, a virtual hand and pencil drew a line on the app. He also enjoyed Newton. This creativity game requires you to draw or create borders in order to get the dropping spheres to hit the targets. They used pencils, drawn lines, and the edge of the paper to complete the levels. 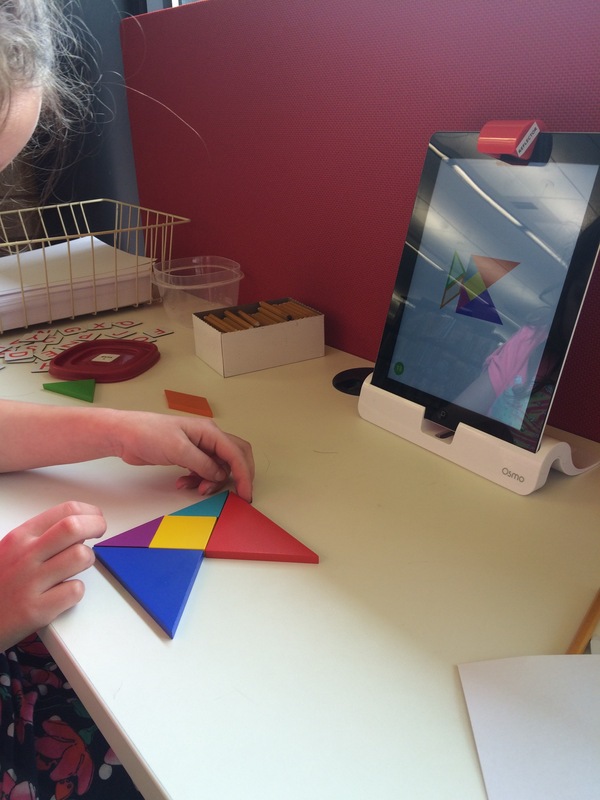 The final of the four Osmo apps is Tangram. It works like the materials you might see in a math kit, except the app provides guidance on shape placement by reflecting what you have created so far. For example, a hand pops up and models for you how to flip or rotate the tan to match the image. Tangram uses math terms accurately. I looked online and found the Osmo kit for $80. The apps are free. 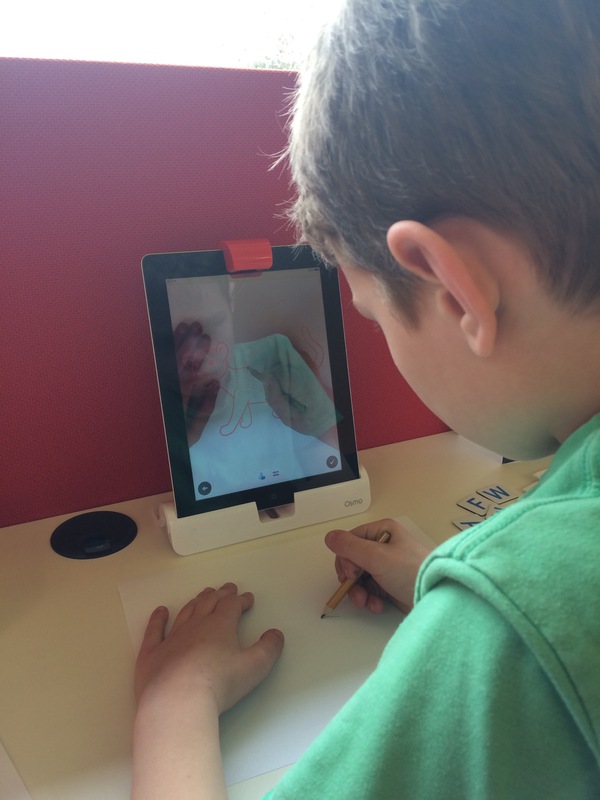 This is definitely technology to consider for primary literacy and numeracy centers in a classroom, as well as for any learner wanting to enhance their drawing and creativity skills. Thanks for sharing these. Some of them look a bit gimmicky, using technology when other items would do the trick e.g. tangrams (except for the onscreen help – but does that reduce opportunities to problem solve?) and hangman. I would like to try masterpiece myself. That one looks interesting. Your comments are honest and make sense, Norah. Masterpiece would make a great fit in an art classroom, or any classroom. I was most impressed with Newton, and how you could use a variety of drawings, items and ways to complete the levels. There really was no limit, lots of possibilities. We saw this and had to have it at McMillan (his local library). Tried it out on my grandkids and they were totally absorbed. Not just a fun game, but something that teaches skills and develops eye hand coordination, far beyond button clicking and touching a screen. In fact, it does a good job of getting out of the way since you rarely touch the screen at all. The on screen help is important, since it confirms correct moves and rewards you when you get it right. The games get harder as you progress, so the on screen hints start to disappear in tangrams and the words get longer and more puzzlely. You can also play the word games in French! Turned that on by mistake. You make a good point, Andy, about how the scaffolding provided by the software helps the learner be successful. Our community is fortunate to have such forward-thinking librarians at McMillan. Previous Previous post: What one thing should a student know, understand, or be able to do by the time they leave elementary school?